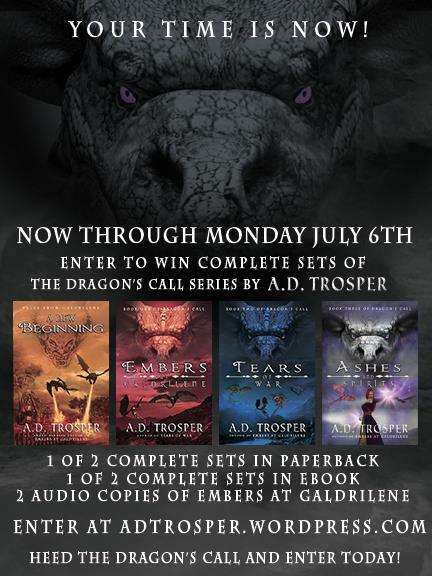 4th of July Dragon’s Call Giveaway! The 4th of July marks the birthday for my nation (well kind of, but its the official day anyway). So as way of saying Happy Birthday, United States I’m doing a giveaway of Dragon’s Call. Full sets include: a copy each of the prequel A New Beginning, and the novels Embers at Galdrilene, Tears of War, and Ashes and Spirits. Well, I’m going to do this a bit differently this time. I don’t really want to do Rafflecopter so instead, there are only one thing you need to do to enter. 1. Comment on this post telling me either why you love dragon stories or (if you’ve already read this series) your favorite scene in the series. If you would be so kind as to share across your social networks (FB, Twitter, Pinterest, etc) it would be deeply appreciated. Thank you. The giveaway runs from now until 11:59 pm on Monday the 6th of July. Once it ends, I will number each comment 1 thru however many there are. Then I will let Random.org decide the winners for a total of six winners. If you’ve already read the series but want the signed paperbacks for your shelf, great! If you haven’t read it but have been wanting to, great! If you already have it all but want me to send the books (ebooks or physical books) to a friend so that you can bring them over to the dark side (we have cookies) as well, great! Sadly, due to shipping costs the paperbacks are only available to residents of the U.S. I am truly sorry. However, the e-books and audio are open to everyone. Also, they are all available through Kindle Unlimited. I think dragons are the ultimate fantasy creature. I very much enjoy how they are portrayed, from evil beasts to thinking, intelligent animals. I love dragon stories because they are the ultimate fantasy creature and to me, represent everything that I love about fantasy books and films. Dragon stories. Ever since I was a little boy I have been obsessed, with the mystery, majesty and power of dragons. I think someone else said it first, dragons represent the ultimate fantasy creature. Either as a background character, or as the main protagonist, there is just something about them that make you aspire to be more, to want more, and to do more. I have read a lot of dragon stories over the years, and for me the best ones have always been the ones where they coexist with humans in harmony to the betterment of both species. In martial arts, the dragon symbolizes wisdom, control, and strength. They serve as the ideal for us to aspire to. I can’t say it any better than Fiona, and she already typed my words! They are just the penultimate creature in fantasy stories and are my favorite animal. Period. The world you’ve developed is amazing, and the characters are so well developed and well written. Love the books. Great giveaway for some truly great books. I have loved Dragon stories ever since I read Anne McCaffrey years ago! I would love to read your stories. Books and dragons. The perfect combo. Enter to win! I really enjoy reading about dragons! They also happen to be our school mascot. Well, I’m not entering for the print versions (unless I can have them sent to a friend in the US if I win). And I’ve read the entire series, and love it. I’ve always loved dragons. The first one I saw was the Lindwurm in Klagenfurt in Austria, quite a statue, part of that town’s saga. (Sadly, it’s a saga of dragon slaying.) And of course, after meeting Mnementh and Ramoth, dragons never were the same. I love dragons because they seem to be the most intelligent of scary things. You had me at dragons! I scour anything related to those larges scaled creatures and at one point in my life was considered a bit crazy to have an entire room painted like the back of a dragon, wing and all. I would love to read these books! I love dragons, they bring fantasy, adventure, and add excitement to the stories they are in . Good vs evil, lost loves brought together living within the books pages. They are mystical creatures waiting to capture your imagination and heart. I love dragons and they are part of my life. I believe they are out there and are waiting to return. Dragons are beautiful and amazing. I’m not sure I have a favorite scene from the book, but my very favorite thing about the book is the connection between the dragons and their riders. It would be so amazing to have a connection like that with another being. I LOVE this series. You write with such imagery and emotion, it brings you really into the story and I just love it. The scene with the one dear – I don’t want to spoil anything – I had to put the book down because I was crying so bad. Amazing. Dragons are the raw power of nature under an intelligent if alien direction. Great storms and volcanoes and rivers. Dragons are a part of the magic and legends that I have always loved. As a young girl (about 4), my mom tells me I had an imaginary pet dragon named Maggie. I like the fact that dragons can be wildly different. Some are Smaug-like, gold hoarder with a big ego, some are lighter in mood, some are mystical creatures that bring wisdom and magic, some are terrifying beasts, but they all have the magic that comes from being a large winged (optional) lizard of legend. In short, I love the versatility. You never get the same one twice. My favorite thing about these books is the depth of the relationships between the dragons and their riders. The dragons are all distinct in their personalities and they compliment the personality of the rider. Dragons are powerful creatures. Visually they are also powerful. Often they represent great evils people need to be battling in life. They were the unconquerable. When done right, dragons can be amazing metaphors for life journeys and internal battles. When done as just monsters, the stories often feel empty. Yay for Dragons! I wish I was a dragon rider! I just hope they don’t like to eat my goats. That would be sad….ok well books about dragons is the next best thing. Due to issues with ACX, Ashes is having trouble finding a narrator. Unfortunately, it may be a while before it finds its way into audio. Thank you all so much for entering! I numbered the entries 1 thru 23 in order of their posting and then let Random.org decide. I will be creating a new blog post in a few minutes to announce the winners. « OMG, Amazon Changed How They Pay For Borrows, The Sky Is Falling!